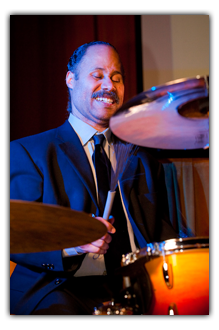 Veteran bandleader and drummer Ron Steen is one of the Northwest’s top rhythm keepers and a leader of the Portland jazz scene. He is also the Godfather of Jazz Jams in Portland, having hosted ongoing jam sessions since 1980, including the famed jam at Produce Row. Notable international jazz stars who come through town stop in to Steen’s jams for impromptu music, led by one of the best in the business. In addition to hosting five jam sessions, Steen is also a sought after bandleader and session musician, who his peers hold in high regard for his solid and versatile rhythms and his engaging personality. Steen’s ability to bring together the top musicians in town and around the nation makes him one of the city’s most valuable assets.